Right Click and Open in a New Window to enlarge most images. We reserve all rights of reproduction and enforce copyrights. Nancy Gorglione and Greg Cherry of Cherry Optical Holography have a long history of producing laser scanning as an art form, often in collaborative performance with musicians and dancers. 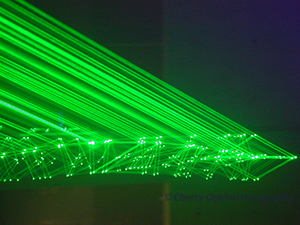 We were there to spur on the evolution of the laser as artist's tool. Laser light's mesmerizing ability to sync with sound spurred the development of performance structures with laser light a star of the show. From large theater venues to skyscrapers to mountain tops and windswept sand dune beaches to intimate living room thematic rituals, we fired up the most colorful lasers we could find. 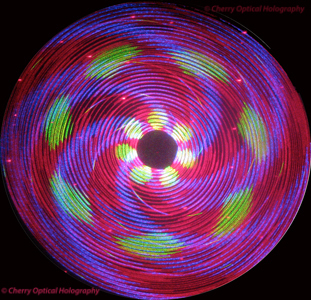 Cherry Optical's Laser Mandala Shaped by Sound. Below is a history of our laser performances, and some related musical events. 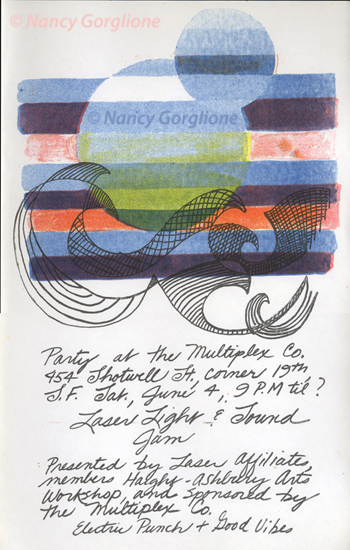 As Laser Affiliates, Nancy Gorglione began producing the Light Sound Motion Performance Series with an event at the Multiplex Company (formerly the School of Holography) on Shotwell Street in San Francisco, in 1974. 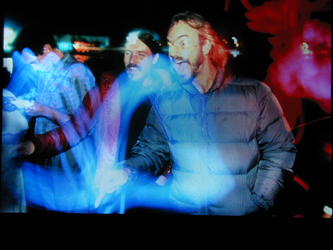 Further laser light shows, including the US Cafe Series in 1976, introduced lasers into the Haight Ashbury culture of light shows. The aesthetic and technical synchronization of light and sound is a lifelong pursuit for Gorglione. 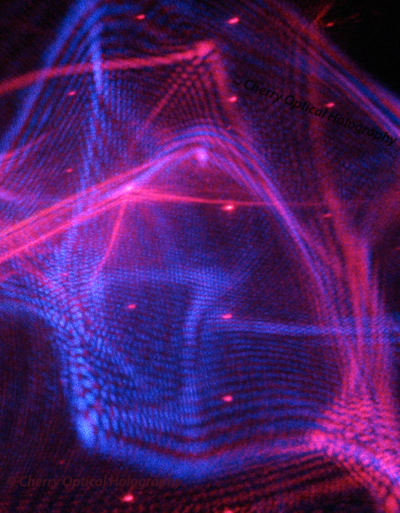 The sheer beauty and power to uplift is inherent in single frequencies of laser light and sound. 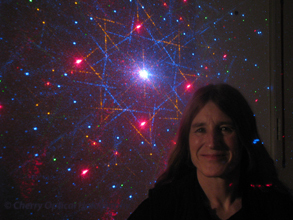 Nancy Gorglione directed Laser Affiliates, a cooperative of laser artists who informally worked together under the auspices of the Haight Ashbury Arts Workshop from 1973 to 1994, and then as an independent organization until 2002, when Laser Affiliates was merged into Cherry Optical Holography. At the Haight Ashbury Arts Workshop, diverse neighborhood community arts' programs along with the Laser Arts included: the Jazz Music Workshop; Mural Arts; a film production group, Fine Lines Films; People's Media Collective-Community Radio; and Theater Arts, from Giant Puppets to The Young People's Program. The Haight Ashbury Arts Workshop maintained a storefront on Stanyon St. by Golden Gate Park. In retrospect, it was historically significant that we developed laser light shows through the Haight Ashbury Arts Workshop. Even our storefront location was famous, first as a home for the Diggers, who dished out free food from the arched entryway, to early Hari Krishna devotees. The storefront space next evolved to the Haight Ashbury Arts Workshop. It was a vastly creative and enlightening time in San Francisco. Waves of the Hippy movement reinformed our thoughts and beings about the interconnection of all things. It was possible to survive and sometimes thrive through creating art as a way of life. And, rapidly developing technology was at our doorstep. 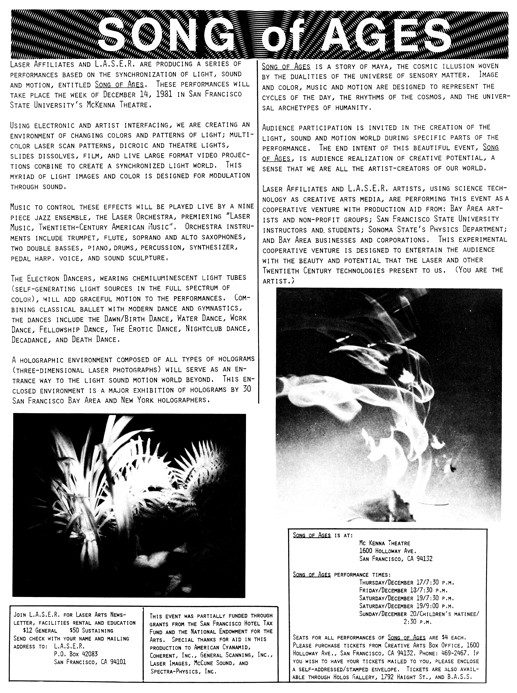 During Song Of Ages in 1981, (pictured on this page and below in this scroll box) Greg Cherry began engineering laser scan systems for Laser Affiliates. Greg is a prototype model maker keen from the early days of laser scanning, when umbilical cords full of 220 three-phase high voltage power and 5 gallon a minute water-cooling hoses, in and out of the laser head, were the only way to get significant laser power to light up a mountainside. 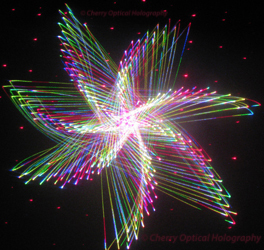 A few stills (above and within this scroll box) from Cherry Optical Holography's Analog Color Scanning System, Sparklelight 2010. We produce Laser Light and Sound Performances on Equinoxes, Solstices, and some Eclipses, often with the Laser Light & Percussion Orchestra in Sonoma County, California. Please send us email to be notified of performances. We Are the Weathermakers, poster for one of the Laser Light & Percussion Orchestra Performances. 2009-2017 Description of Some of Our Larger Performances: Events produced by Cherry Optical Holography are in boldface type. 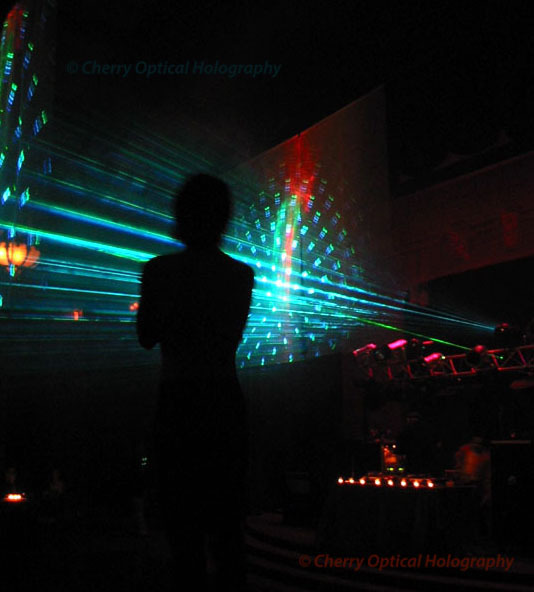 As the Seasons change, the lasers come out at Cherry Optical Holography in thematic performances. Ongoing. 12-21-12 Anniversary Night under the Laser Lights for the Laser Light & Percussion Orchestra at Cherry Optical Holography Ranch. SparkleLight 2012, Greg Cherry's analog and digital scanning system projects sound modified patterns of laser light with bright multicolor diode lasers. 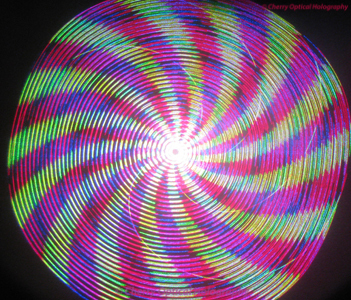 Greg Cherry creates Sparklelight 2010, our multicolor analog laser system, with pulsed color control and audio images, holographic and virtual imagery. The Bass patterns the laser! Cherry Optical Holography adds several new projection systems which could fit into a (large) briefcase. 2009 Rhythm: The Evolutionary Musical; Lasers by Nancy Gorglione and Greg Cherry and Cherry Optical Holography; Percussion with Nancy Gorglione playing gongs, surdu and djembe in a seven piece orchestra. Produced and Directed by Michael DiMartini, Santa Cruz Vets’ Theatre Hall. August. 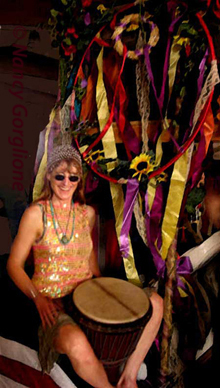 Drum & Dance lead by Gorglione at the World Music Festival, Grass Valley, CA. Harmony Festival; Sierra Nevada World Music Festival; Synergetics: Shamans Music in the Redwood, Mendocino; World Music Fest Nevada City, CA. 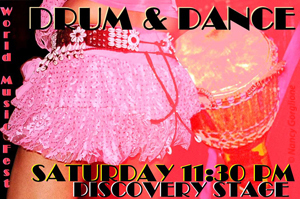 2005-2006, Drumming at Firedance; Phoenix Firedance, and Fire Drums... all in the California Redwood Forests. 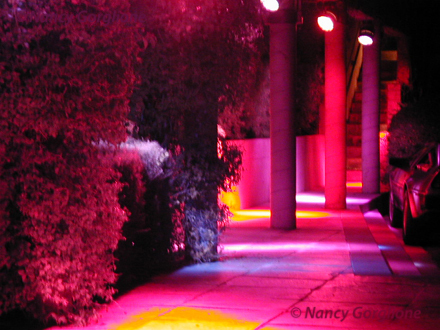 2006 Laser Light & Percussion Orchestra, private parties and outdoor events in Sonoma County. N. Gorglione drumming on a Float at Harmony. 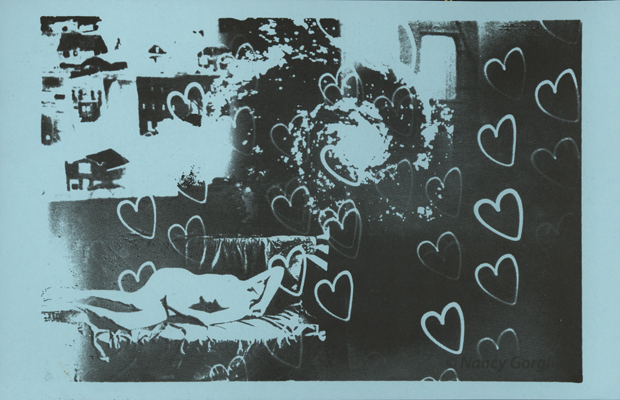 2005 Harmony Music Festival, Drums on Wavy Gravy’s Float, Tarot paintings & installation. Laser Light & Percussion Orchestra, En-Trance, Kundalini trance dance at Cherry Optical, July 30, 2005. Laser Starlight at Institute of Noetic Sciences, (IONS) Petaluma, CA. Lasers and gongs under the stars, July 22, 2005. Gongs in the Altar Temple, along with a large format hologram illuminated with solar power. Saturday Night at Harmony Festival, Santa Rosa, June, 2005. Gong and surdu with Bethany Argile Performance Poetry, Harmony Festival, Santa Rosa, June, 2005. 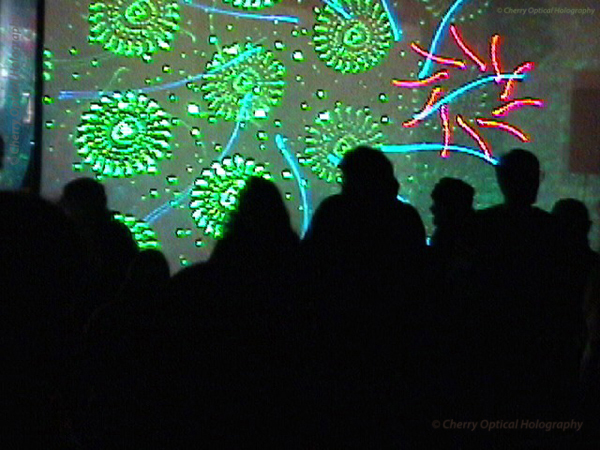 Laser Light & Percussion Orchestra DVD, video of performances by Nancy Gorglione, Greg Cherry with Cherry Optical's Sparklelight systems with additional lasers by Northern California laser artists. Video of many events featuring diverse community percussion orchestras. Includes a Channel 50 local television newscast about "The Laser Enlightenment Device," Edited by Louis Bekram, Laughing Cat Films. 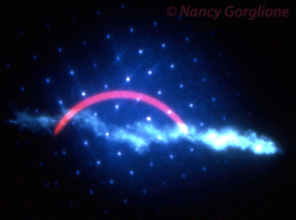 Travel Reflection Hologram Composite by Nancy Gorglione, collection Milk River Travel Museum, Canada. 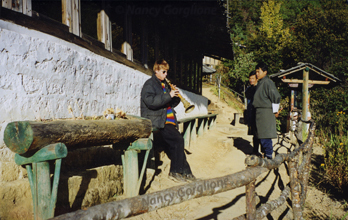 Gorglione travels to Tibet, Dharamsala and Delhi to study ritual music. While in Dharamsala, a old Tibetan spins a globe and points at West Africa. Spring 2005 Gorglione returns to India and then, Africa: Delhi then train to Drepung Loseling Monastery in Mundgod, Karnataka; then to Africa! Ethiopia; then Accra, Ghana, to study drumming with the Akwaaba Cultural Group, a 22 person drum & dance orchestra. Travel through West Africa's Togo, to Porto Nuevo, Benin; and some travel and a drum lesson in Nigeria. Return from Africa through Amsterdam. Laser Light & Percussion Orchestra, Epiphany’s Music & Recording, Santa Rosa. Circadian rhythms from some goddess bass players in this community orchestra for all. December 18, 2004. Hurricane! Laser Percussion Orchestra played heavy bass drums along with the gongs and percussion orchestra, in a Weathermaker’s event for Haiti & Florida during the hurricane season. 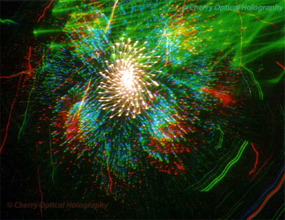 Sun into Leo, Laser Light & Percussion Orchestra at Cherry Optical, Sebastopol, July. The Laser Percussion Orchestra featured language of light laser patterns with community drum and percussion orchestra. Venus Combust, Laser Light & Percussion Orchestra at Cherry Optical, Sebastopol, June. The Laser Percussion Orchestra paisley and complexity laser light patterns with call and response community drum and percussion orchestra. Coordinator, Multiple Laser Sites for Health & Harmony MBL Saturday Night Techo Tribal Party, June, A huge multi light extravaganza including large Yag lasers and white light lasers, the laser chakra device, video projection, slide dissolves and music by Lost at Last and Mutayter, with a crowd of 3500. Rhythms of Light - 22nd Century Village Music by Laser Light & Percussion Orchestra, Open Space, 400 Morris St. Sebastopol, with entryway of monochromatic light and a dozen holograms, May. 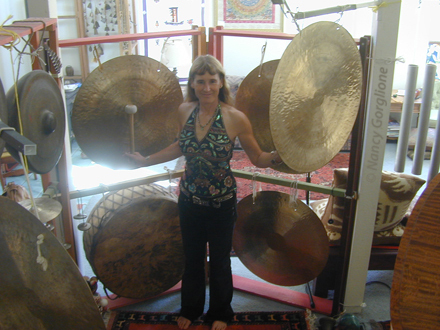 Sunday Evening Meditative Music, Gorglione on gongs and tubular bells with Kim Atkinson, Mystic Beat Lounge, Odd Fellows Hall, Sebastopol, CA. Fire & Light at Sebastopol Town Square. Laser Affiliates, Cherry Optical Holography, Laser Productions, local 'Burners and Dan Schweitzer's Ghost. Fire & Light- Laser Light & Percussion Orchestra participatory community percussion performance surrounded with lasers and special lighting at Sebastopol Town Square-City Center, December. Nancy Gorglione on Gongs Directed Lasers by Greg Cherry with Laser Affiliates, Cherry Optical Holography, Craig Charbboneau and S. Anderson. 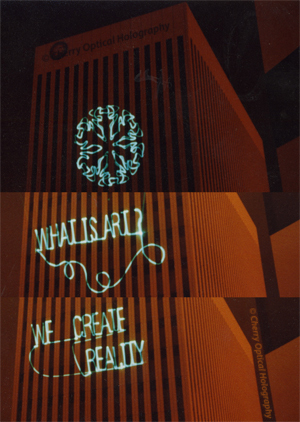 Light projections with Vince D'Onofrio, Alan Rhody and Leigh Anne. About 40 Drummers, Medicine Drum with Bethany Argile, and Percussion, facilitated by Kim Atkinson with Peter Van Gorter on Digeridoo. Received a proclamation from the Mayor proclaiming the night to be Fire Light Night “forevermore.” Large format holography as part of the scenery. December 2001. Beginning of Weathermakers Trance Dance Performances Outdoors at locations in Sonoma County. Initial performance at Cherry Optical, Sebastopol, CA. New Years Eve at the Fortress 2000, Cherry Optical Holography laser scanning and monochromatic light design for Laser Rays at an archetypal California party in Los Angeles. The producer and owner of the Fortress gave out more then 400 quartets of tickets, flew in the World's best DJ's, and had every type of light device installed in his dance hall ceiling, where the new millenium was danced-in by all. Hathor Celebration, Laser Direction and Gongs, Peacock Gulch Country Club, San Rafael, CA The entire Peacock Country Club in Marin County, Ca. was cloaked in 10,000 yards of fabric including screens for multicolored lasers; and decorated to look like an Egyptian Temple for this private party. 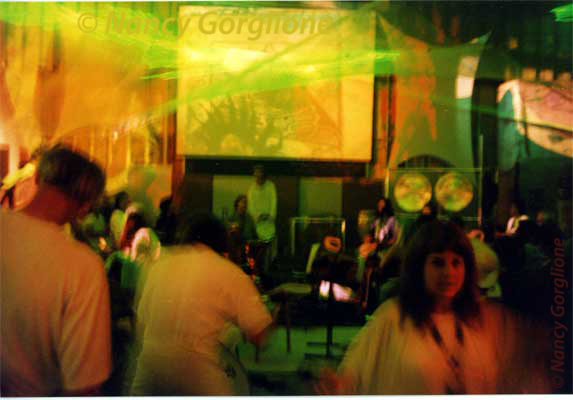 A costume designer made outfits for the 30 person party staff, which included Gorglione clearing the space between musical acts with the gongs, and Cherry Optical Holography running the lasers. 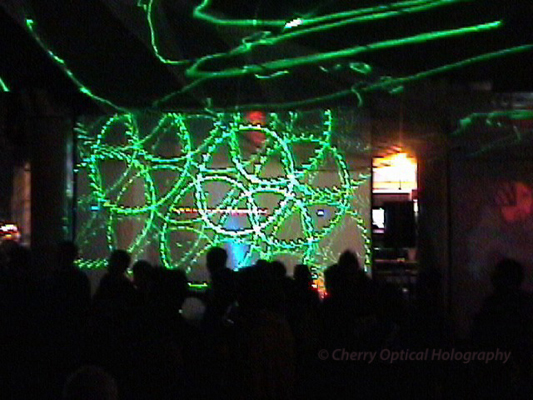 Light & Sound Neuron Perception: Light Sound Motion Performance at Cherry Optical, Sebastopol, CA Sept. 7. 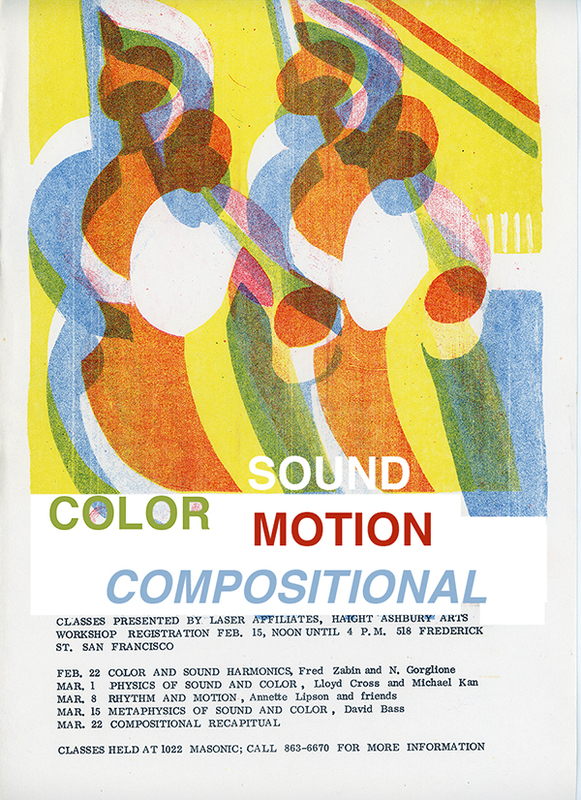 For groups YLEM & LASER during our holography exhibition Resonant Matter. Lasers by Laser Affiliates & Laser Dreams. Cherry Optical's Laser Chakra Device. on Mervin's Department Store for Celebration of the Human Spirit. 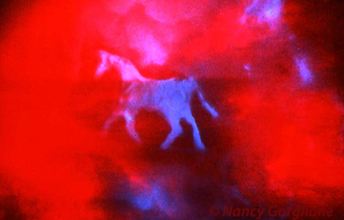 1988 Equus/Underwater, laser illumination effects on phosphorescent screens with a holographic stage set composed of 40 Holograms by Nancy Gorglione and Greg Cherry at the Exploratorium, San Francisco, CA May 21 to June 17. Also at Chicago Museum of Holography 1 in 1989. See Exhibitions Scroll Box. 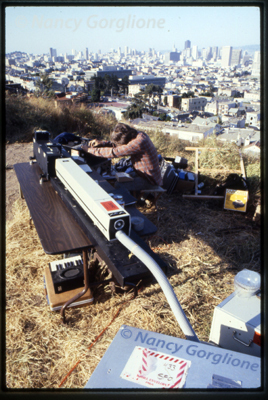 1985 Waveforms for Friends, An argon laser sky illumination and audience participatory performance at the Marin Center Civic Center lagoon area. Over 200 audience performers moved color coordinated chemical lights to trace the waveforms of the electromagnetic spectrum. Music by Ali Akbar School of Music, San Rafael, Ca. Nancy Gorglione & Greg Cherry, with Steve Anderson, Helen Cummings, Laser Rays and twenty community groups. A Small Project Award of Marin InterArts and the SF Foundation. Steam Dreams, multi-lasers, music and dance performance during the Democratic National Convention. Civic Center, San Francisco, CA. San Francisco Civic Center reflector ponds and trees became a staging area for multicolored lasers, holograms and other imagery projected through layers of transparent screens strung from the trees. 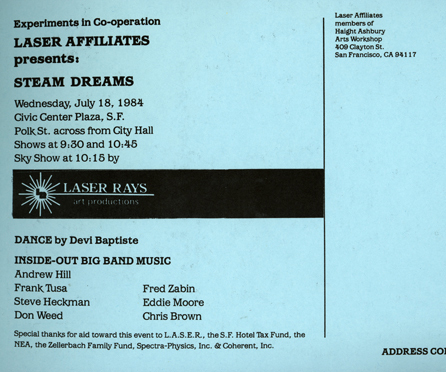 Laser Affiliates and Laser Rays Art Productions with Pat Bishoff. Dance by Devi Baptiste and a seven piece Jazz Orchestra headed by Andrew Hill, with Steve Heckman, Eddie Henderson, Frank Tusa, Fred Zabin and Chris Brown. SF Grants for the Arts Special Project Grant. projected on Davies Symphony Hall outback wall. Laser Paintings, Multi-laser, music and dance performance, parking lot behind Davies Symphony Hall, San Francisco, CA Trumpets by Eddie Henderson and Heikki Koskinen, sound sculpture by Chris Brown and David Rosenboom. Laser Affiliates with Nancy Gorglione, Greg Cherry, Steve Anderson, Jim Feroe and Peter Miller. 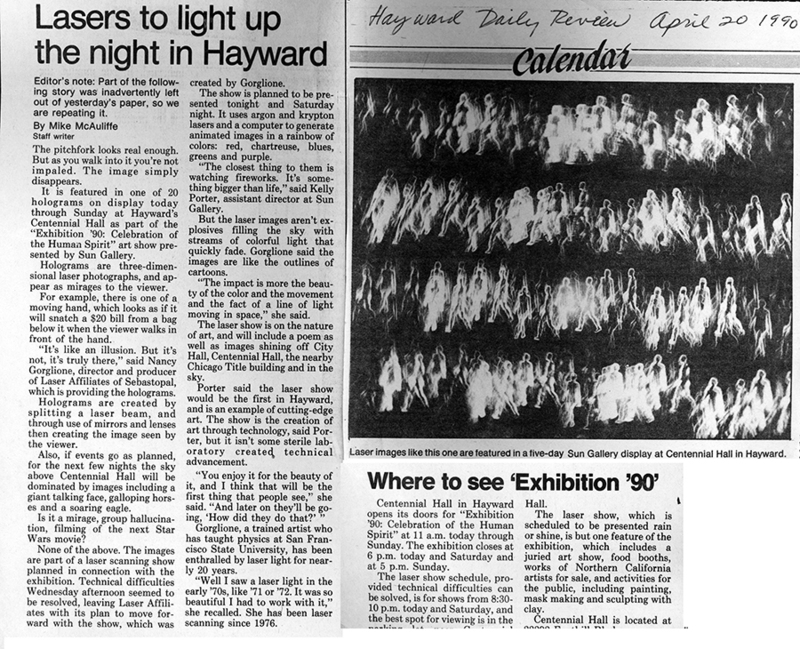 Tidal Wave, A white light laser (the only one at the time, provided by Spectra-Physics, Inc., with Bob Yazell) scanned the grasses while 60 dancers formed a Tidal Wave of moving chemical light in this technological reminder of the forces of nature. Staged outdoors on Corona Heights in San Francisco, a natural rock face high above the City. Laser Affiliates, Director & Producer Nancy Gorglione, laserists Greg Cherry & Steve Anderson, Steve Gill on Chemiluminescent lights, Helen Cummings Dancers including Marin Dance Theater members waving lights; and Peter Miller, Tech Invaluable. Filmed and printed in diverse speeds by Joaquin Wilson/Fine Line Films. A project of SF Grants for the Arts. No Show, multi-laser and monochromatic projections in a benefit for Mission Cultural Center, San Francisco, CA Nancy Gorglione, Greg Cherry, Steve Anderson and Jos Sances. Laser Dinner Lighting, laser and monochromatic lights formed a forest on the edge of a city in a ambient performance for the scientists and supporters of Lawrence Hall of Science, Berkeley, CA. Our most erudite audience. Above, Greg Cherry, Nancy Gorglione, and Steve Anderson. Light Parade, fluid light rained through a dark forest at the end of Golden Gate Park as a hundred paraders moved hand held lights, and played percussion instruments and chimes. Light met lasers and music as paraders left the woods and meadows and flowed over the sand dunes to Golden Gate Beach. Music in the dunes by John Gruntfest Ritual Orchestra. Laser Affiliates & LASER, with Nancy Gorglione, Jeff Milton, Greg Cherry, Steve Anderson, Steve & Yetta Slatter. LASERS/COMPUTER SCANNING STEVE ANDERSON, SONOMA STATE PHYSICS DEPT. GREGORY CHERRY. HEWLETT PACKARD, INC.
NANCY GORGLIONE, SAN FRANCISCO STATE UNIV. PHYSICS DEPT. LORI LUBESKI, S.F. STATE CREATIVE WRITING DEPT. CHEMILUMINESCENT LIGHTS STEVE. K. GILL - RESEARCH AND APPLICATIONS, LIQUID LIGHT LABORATORIES DAVID ABERCROMBIE, U.C. BERKELEY CHEMISTRY DEPT. JOSH DUBERMAN, CHEVRON Research CORP.
HOLOGRAPHIC ARTISTS: STEVE ANDERSON, DR. STEPHEN BENTON, RUDIE BERKHOUT, KENT CAROLL, SHERWIN CHEW, GREGORY CHERRY, PETER CLAUDIUS, KEN COOPERMAN, GLORIA DIBIASE, VINCENT DIBIASE, JUDY EISEN, JAMES FEROE, BRUCE GOLDBERG, NANCY GORGLIONE, RANDY JAMES, JOHN KAUFMAN, SHARON MCCORMICK, STEVE MCGREW, PETER MILLER, JEFFREY W. MILTON, LON MOORE, SAME MOREE, RUBIN NUNEZ, STEVE PROVINCE, VIC RICE, BOB SCHLESINGER, DAN SCHWEITZER, STEVE SLATER, DEBRA SHORT, IRA SLOBODIEN, FRED UNTERSEHER, GARY ZELLERBACH, S.F. STATE UNIV. 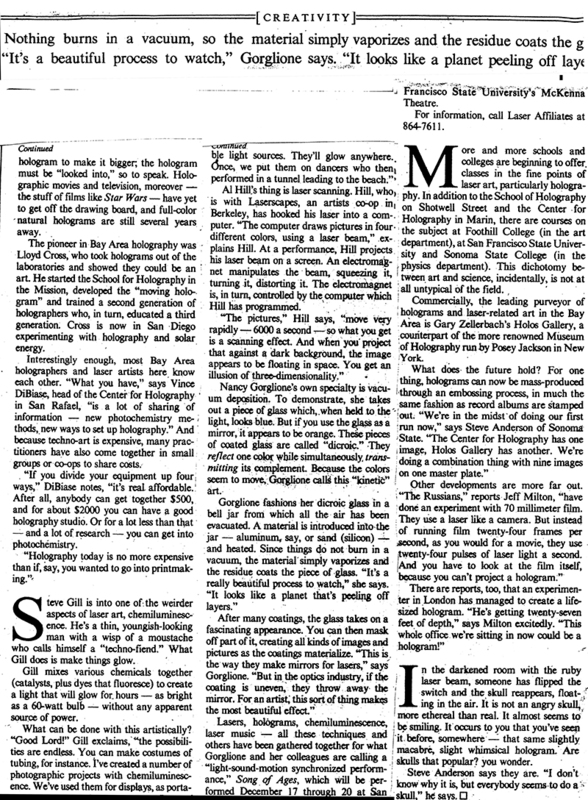 PHYSICS’ DEPARTMENT -HOLOGRAPHY STUDENTS (LIST INCLUDES PIECES FROM THE COLLECTION OF HOLOS GALLERY, S.F. JOHN BARSOTTI, BROADCAST COMUNICATIONS ARTS FACULTY DEPT., S.F. STATE UNIV. S.F. STATE BROADCASTING COMMUNICATIONS ARTS’ STUDENTS: MICHAEL BENEDETTI, ROBIN BURNS, FRIDAY FORSTHOFF, MIKE JACKSON, GILBERT JOHNSON, JACK MILLPOINTER, MICHAEL VAN METRE, KEVIN WHITE, SUSAN WILSON. SPONSORED ON SAN FRANCISCO STATE UNIVERSITY CAMPUS BY DR. GERALD FISHER AND DR. J. BERKE, PHYSICS AND ASTRONOMY DEPT. 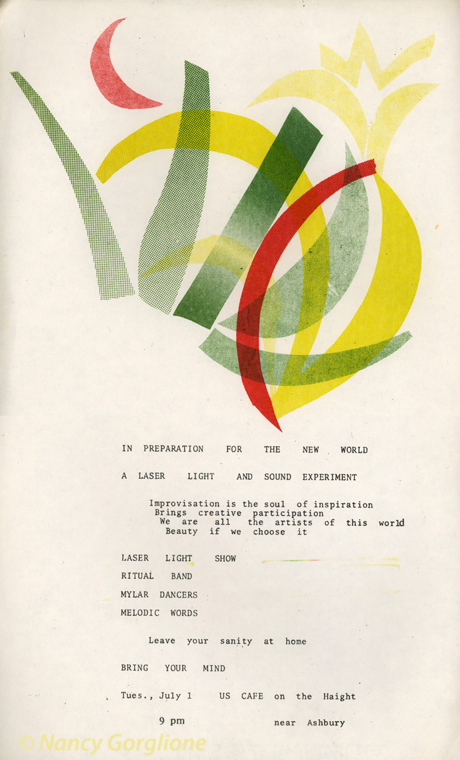 Laser Art: The Newest Frontier in Techo-Aesthetics by Walter Blum, in anticipation of Laser Affiliates' Song of Ages. San Francisco Chronicle Sunday Magazine 1981. 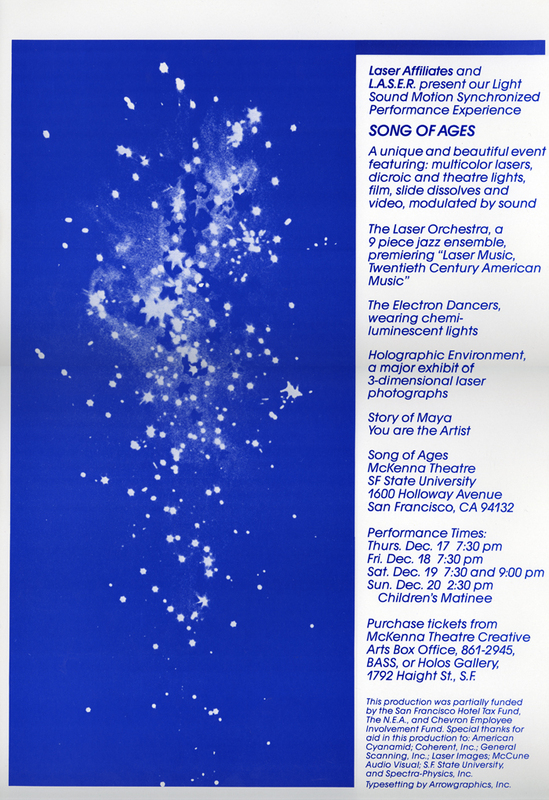 1981 Song of Ages, Story of Maya produced and Directed by Nancy Gorglione. 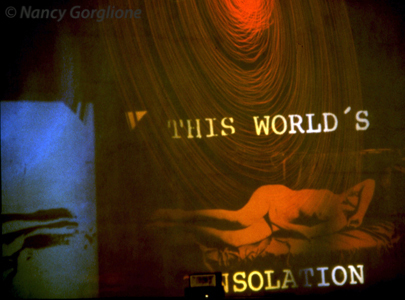 Over 50 artists combined lasers and light effects, video projection, film and dance in this performance series at McKenna Theater at San Francisco State University, where Gorglione was Adjunct Professor of Holography in the Physics Department. Song of Ages, Story of Maya, featured a ten piece Jazz Orchestra lead by Heikki Koskinen playing for dancers wearing multicolored chemical lights as they danced the cycles of the day, from Dawn Birth through Decadance and Death to Dawn. It took Gorglione all year to produce and direct this December series of performances, with funding from NEA; SF Grants for the Arts; family, friends, etc. Holographic Environment with 35 pieces by diverse holographers in the lobby. 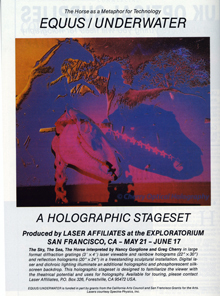 A pivotal performance series which introduced the laser and holography in performance arts. 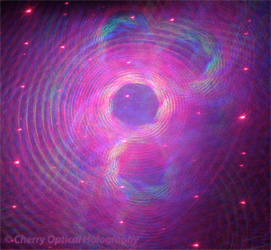 Tunnel Dance Composite Overview, from Archetypes in Holography: If You Can See It, Its Not There. Tunnel Dance Composite Overview, a partial page from Archetypes in Holography::"If You Can See It, Its Not There" by Nancy Gorglione. (2017) This book contains hundreds of laser art, scanning and performance images from the events listed here. Tunnel Dance, laser, chemical light, music and dance performance at Judah Tunnel, Ocean Beach, San Francisco, CA. Music for wind harp, horn and percussion including musicians Rod Marymore, David Schrader and others, reverberated with light in the long N. Judah Ocean Beach Tunnel. 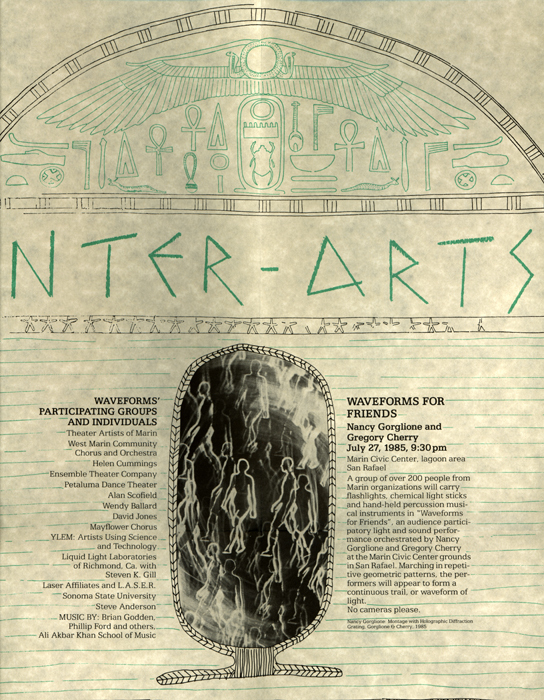 Laser Affiliates' Lights by The Shrieker, Jeff Milton, Steve Anderson, Lewis Brill and including Dance with members of magical Anna Helprin’s Dancer’s Workshop in SF, including Mitsuko Mitsueda and Troupe. 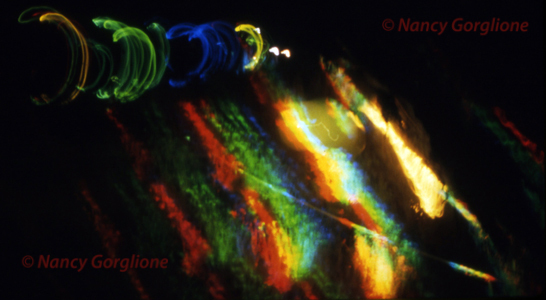 The event that eventually led to a small grant to partially produce Lightscapes, Photography & the Laser. Lights Project, KYA Radio sponsored light show on Twin Peaks, CA, Gorglione was Laser Site Coordinator for Scott Redmond; Large Argon Laser Scanning by Norman Ballard. Dichroic filtered Kleig Lights beamed across the Bay, synchronized with KYA. Radio Station broadcasted music. Darwin and Roger Greene on Diesel Generator. Gorglione - Jazz study at the Haight Ashbury Arts Workshop with Fred Zabin, Larry Hancock and others. Today, the latest incarnations of Greg Cherry's Sparklelight Laser Systems combine analog and digital laser scanning for multiple color laser displays - responsive to sound. 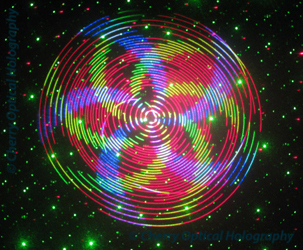 Moving laser imagery is enhanced by custom holographic diffraction effects by Nancy Gorglione and Greg Cherry which are unique in the World. Dressage Horse Holographic Grating by Greg Cherry and Nancy Gorglione, part of the rear stage imagery for Equus/Underwater, A Holographic Stage Set with Laser Lighting. 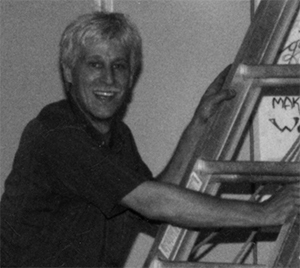 Greg Cherry (pictured above) began engineering laser scan systems for Laser Affiliates during Song Of Ages in 1981. (pictured in the next few images) Photos of Song of Ages by Greg Cherry and Jeffrey W. Milton. 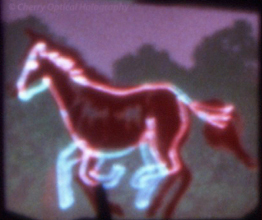 Fluorescent Laser Scanning by Cherry Optical Holography on specially designed silkscreen stage backdrops from Equus/Underwater, A Holographic Stage Set by Nancy Gorglione & Greg Cherry. 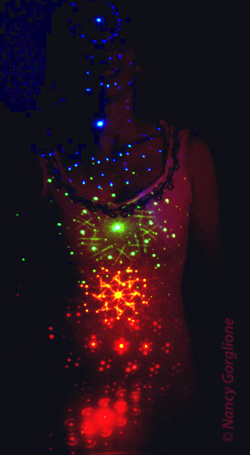 Cherry Optical Holography's color analog laser scanning systems create mandalas of light from sound. 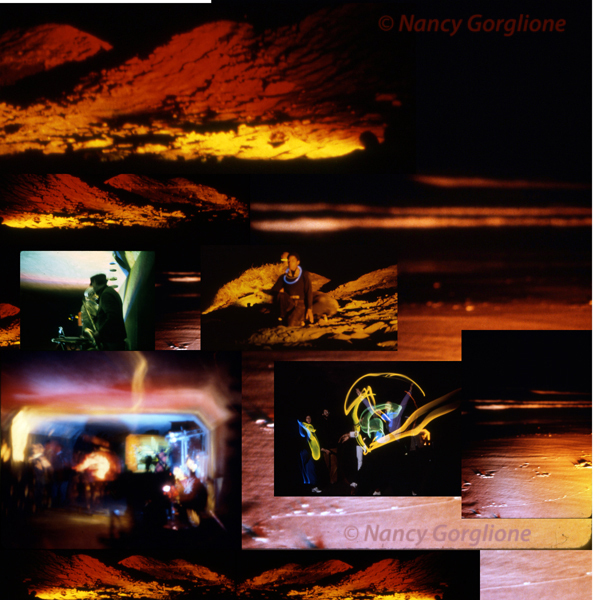 In 1988, Nancy Gorglione with Cherry Optical Holography began designing and holographing stage set environments with Equus/Underwater, A Holographic Stage Set. Equus/Underwater, A Holographic StageSet, original silk screened poster by Jos Sances from images by Nancy Gorglione and Greg Cherry. 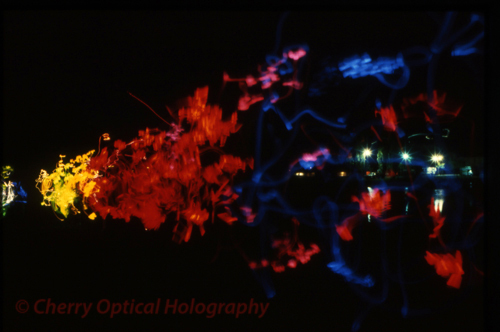 at the Exploratorium in San Francisco, Summer, 1988; and then toured to the Chicago Museum of Holography in 1989-90. 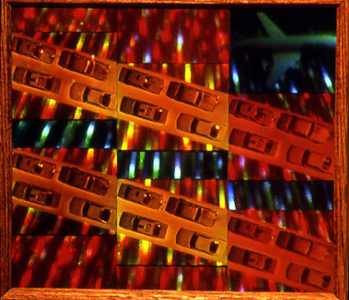 Large Sculptural variations of the Clouds Holograms, 8 large panels of colorful transmission holograms suspended from the ceiling, were exhibited at Artec, Nagoya, Japan -1995; Sonoma Museum of Modern Art, 1996; Rhythms of Light, Performance and Holography Exhibit, CA, 2003. 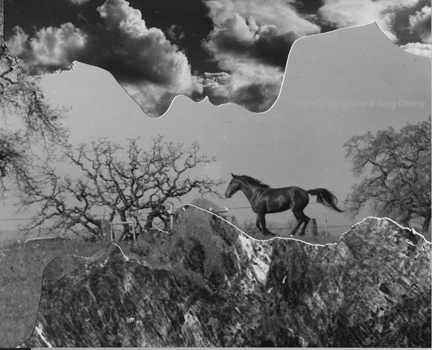 Equus/Underwater, A Holographic Stage Set, front holographic panels featuring a projecting horse galloping by the side of a river, with layered panels of holographic clouds in the sky. 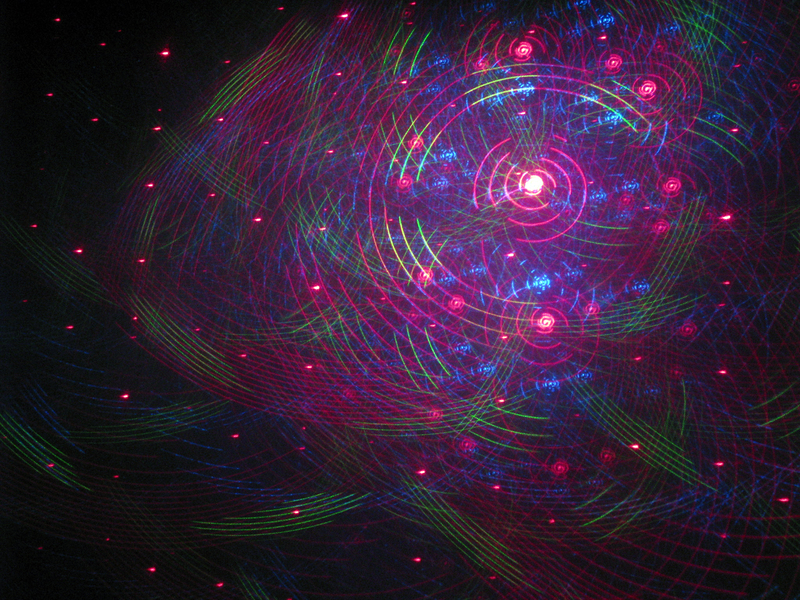 Transmission holograms by Nancy Gorglione, each 22 inches by 30 inches. 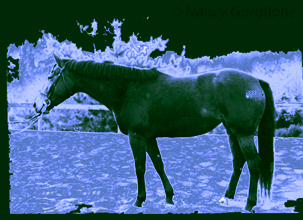 A laser scan by Greg Cherry and Gorglione of an animated horse gallops in the background. Exploratorium installation pictured. Uncirculated Invitation to a private view of Equus/Underwater, below. Pre-computer photographic imagery by Greg Cherry. Argon Laser Scanning by Cherry Optical Holography front projected onto downtown skyscrapers in Hayward, CA, Sponsored by Sun Gallery & Mervins. 200 participants formed the waveforms of the electromagnetic spectrum, reflected in a lagoon in Waveforms for Friends by Nancy Gorglione and Greg Cherry with Laser Affiliates. Photo by L. Watts. 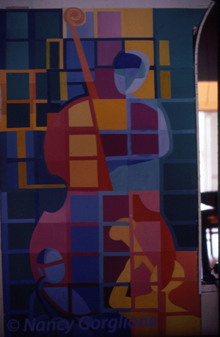 Project Marin Grants for the Arts/SF Foundation. Light & Sound Parade: Hand held lights and percussion instrument met a Jazz Orchestra on San Francisco Beach, where dichroic light illuminated the sand dunes and an argon laser etched light runes in the sand. Produced by Laser Affiliates and L.A.S.E.R. 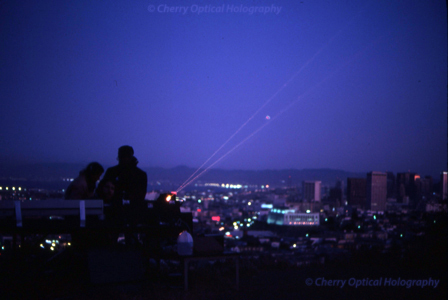 Greg Cherry tweaking in the laser above San Francisco in 1983. Tidal Wave! 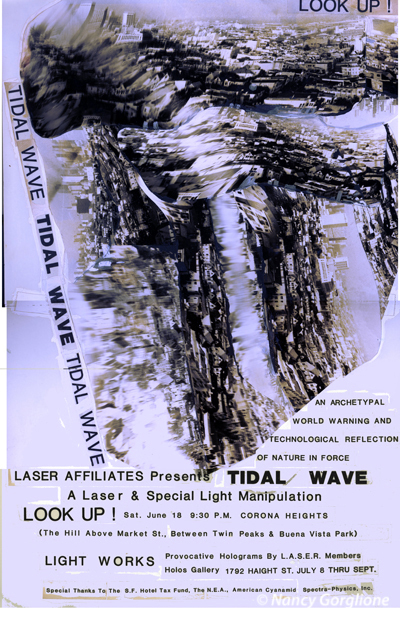 Hand Painted Poster advertising the laser and special light show Tidal Wave: An Archetypal World Warning and Technological Reflection of Nature In Force. Poster images from a photo montage by Greg Cherry and Nancy Gorglione. Over 40 large format holograms sculpted a walk-though environment in our Holographic Stage Set, Equus/Underwater. Song of Ages featured a ten piece Jazz Orchestra. The laser artists, holographers and musicians who collaborated with Gorglione on this pivotal performance series are listed in the scroll bar above. Laser light's mesmerizing ability to sync with sound spurred the development of performance structures with laser light a star of the music. we were there with the most colorful lasers we could find. enhanced scanning argon laser at a Northern California music festival. forevermore Fire Laser Light Night. The Laser Light & Percussion Orchestra meets in California and parts West. Please email for notifications of our community laser orchestra events. Nini Gorglione plays gongs and hand drums under the laser lights. Nini Gorglione plays gongs and hand drums in community orchestras and music festivities, for intimate' wine caves, chill rooms and yoga studios, accompanied by laser lighting from Cherry Optical Holography..
With Song of Ages, we pioneered lighting effects which have subsequently become mainstays of music festivals everywhere. The audience formed a cohesive, moving Tidal Wave of light with Steve Gill's specially dyed chemiluminescent lights. Tidal Wave, Laser Affiliates' multi-light extravaganza on "Goat Hill" in San Francisco. 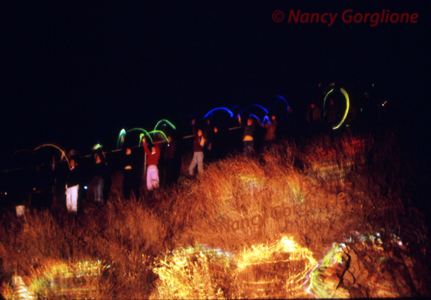 A white light laser graced the hillside, while participants created the Tidal Wave with specially-dyed Chemiluminescent light light down the mountain side. Look for her next book on the Nez Perce.